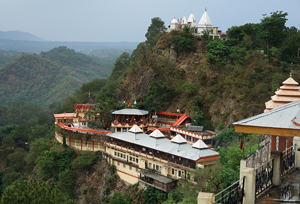 Situated on the border of Hamirpur and Bilaspur, Deotsidh Temple is amongst the most popular shrines in Hamirpur district. Deotsidh is a cave temple that is dedicated to Baba Balaknath. It is believed that the sage meditated here. Baba Balak Nath was a spiritual reformer during the time of Shakti movement and is appreciated for his acts of philanthropy. The Deotsidh temple is inaccessible; however, they can see the deity from a raised platform located in front of the cave temple. On Sunday, a large number of Hindu devotees swarm the temple and offer sweetened Indian flour breads known as Rota. On the occasions of Holi and Navratri, the temple is thronged by a sizable number of devotees, thus making the temple one of the biggest revenue sources in Himachal Pradesh. At a short distance from Deotsidh, a ride on a cable car can be enjoyed till Shah talai. One can also view the Bhakra Nangal Dam and the famed Naina Devi Temple from here.